Castle Island - Historic Fort Independence is the centerpiece at nearby Castle Island. A park surrounds the fort where many people exercise, picnic, or go fishing. George's Island - Take a ferry out to George's Island and visit historic Fort Warren. Read the tale about The Lady in Black ghost that supposedly haunts the island. Harvard Square - The square can be a cross between Greenwich Village in New York and Piccadilly Circus in London, and the home of Ivy League Harvard University. Saugus Iron Works - A replica of the works have been built at the site of the first successful iron foundry in America. There a small museum and a working forge-hammer and water wheel. Walden Pond - Henry David Thoreau made his famous sojourn at Walden Pond in 1845. Today there are hiking trails, a beach, and a replica of his one-room cabin at this State Park. Salem, MA - Salem is best known as The Witch City, with special events each Halloween. It also has a shopping district, museums, Salem Willows Park, and is rich in maritime history. Salem Willows Park - Salem Willows is a beautiful publilc park set on a rocky peninsula that juts into Salem Harbor. There are old-fashioned arcades, a pier, and several take-out stands. 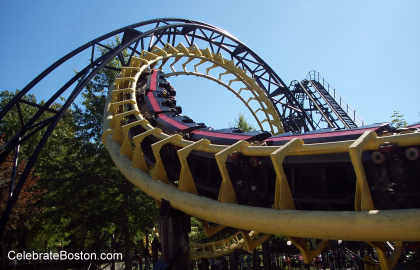 Canobie Lake Park - For more than a century people have visited this popular amusement park. Everything from arcades to a corkscrew roller coaster to open-air performances. Salisbury Beach - A four-mile long beautiful sandy beach known for its tall waves and riptides. There is an adjacent central amusement area, with a state park and campground on the southern end. Lizzie Borden House - Lizzie Borden was acquitted for the axe murders of her parents. Her former home is now a Bed & Breakfast, and it has been reported that spirits still dwell inside.